Everidge brands ThermalRite and ICS will be exhibiting at The NAFEM Show 2019, held at the Orange County Convention Center in Orlando, FL, February 7-9. 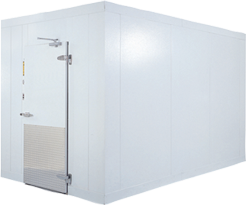 ThermalRite provides a specialty line of cook-chill equipment and custom walk-in solutions to the foodservice industry, and ICS provides one-piece walk-in units for chain foodservice clients. The two brands will exhibit at booth #1851. ThermalRite is debuting two new products at The NAFEM Show: a blast chiller and a sous vide cooker. The blast chiller boasts several convenient benefits and performance upgrades. The sous vide cooker will complete ThermalRite’s line of cook-chill products and will be the brand’s launch into cooking equipment. Chef-led demonstrations at the Everidge booth will showcase the full ThermalRite cook-chill specialty line: cold prep table, new sous vide cooker, vacuum sealer and new blast chiller. Demos will be held every hour, on the hour during the show and will be led by Chef Michael Kelly and Chef Raik Seifert Gomez. Chef Michael Kelly is the Everidge corporate R&D chef and sales manager for ThermalRite and helps partner with customers on menu development using ThermalRite’s specialty products. Chef Kelly graduated from Le Cordon Bleu and has worked as a chef for West Virginia University and the Pittsburgh Steelers, as well as foodservice institutions. Chef Raik Seifert Gomez has 20 years of experience in the hospitality industry in Spain, France, Germany, Columbia and Mexico. Chef Gomez specializes in the development and launch of food manufacturing procedures for storing and distribution on an industrial level. He is an expert in sous vide and current trends in food safety. Additionally, the NAFEM booth will include ThermalRite and ICS walk-ins, several walk-in features and accessories, and a before-and-after refurbished walk-in. Make plans to visit the team at The NAFEM Show 2019 booth #1851 to discuss refrigeration and cook-chill solutions for your foodservice operation. Thursday, Feb. 7 – 9:00 a.m. to 5:00 p.m.
Friday, Feb. 8 – 9:00 a.m. to 5:00 p.m.
Saturday, Feb. 9 – 9:00 a.m. to 3:00 p.m.